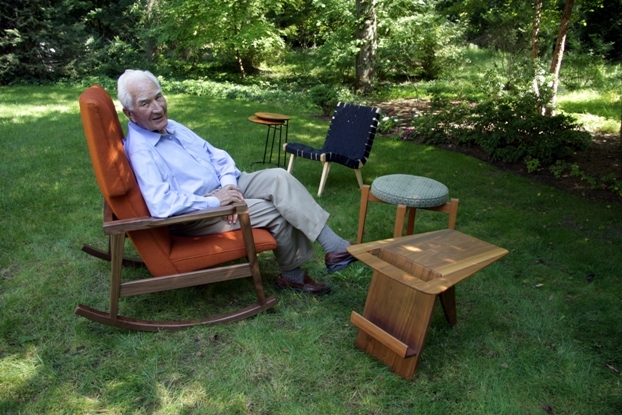 Furniture designer Jens Risom arrived in New York City from Denmark at the age of 23 in 1939. It would not take long for him to be credited as one of the first designers to bring simple Scandinavian furniture design to the United States. In less than two years he established a business relationship with entrepreneur Hans Knoll, and the two set out on a cross-country business trip of sorts, talking with modern architects and exploring the market potential for Risom’s designs. Upon their return to New York, they launched the Hans Knoll Furniture Company, in 1942, with Knoll handling the business end and Risom serving as the primary designer. Risom would design only about 15 pieces of furniture for the first Knoll catalogue before he was drafted into the US Army, where he served under George S. Patton. Yet those few pieces constituted an impressive contribution, representing 75% of a product line that remains well known and popular today. Known as the “600” line, it included cabinets, bookcases, and an amoeba-shaped coffee table. 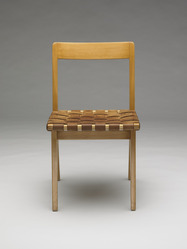 Perhaps the most recognizable item was the web-seated side chair; manufactured during wartime, when traditional furniture-making materials were scarce, it was constructed with military-rejected parachute webbing. After returning from the war, rather than stay on at Knoll as one of a stable of designers, Risom formed his own company in 1946 so that he had complete design, manufacturing, and marketing control. Also, his name, rather than Knoll’s, would be equated with the well-designed and well-crafted contemporary furniture that was becoming increasingly in demand. 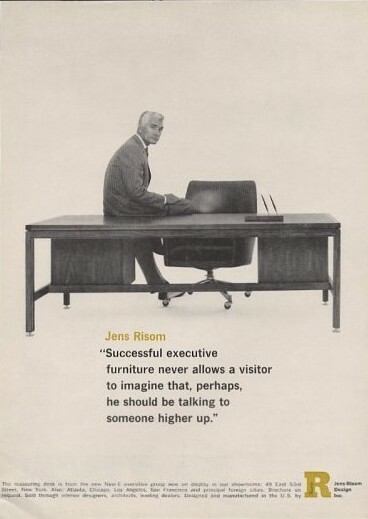 In the early 1950s he teamed up with fashion photographer Richard Avedon on a series of advertisements with the tag line, “The Answer is Risom!” “We wanted to hire someone who had never photographed furniture,” Risom said in later years conversation. Avedon said, “I want no interference.” The ads were seductive, featuring only a piece of Risom’s furniture and one or two people in a sensuous pose. Avedon came up with the tag line, and the marketing department at Saks Fifth Avenue created the type font for the ads’ text. The campaign proved so successful that Risom was soon in need of a larger production space and more workers. Thus, the implosion of the local economy in North Grosvenordale, almost simultaneous with the burgeoning popularity of Risom-designed furniture, created a fortuitous opportunity for all concerned. In 1955, the Connecticut Development Commission, in its mission to bring new industry to Connecticut, approached Risom in New York. “It was ideal,” says Risom, referring to the practically turn-key operation with all the space he wanted at 42¢ per square foot and an available local work force. He set up an on-the-job paid apprenticeship and an after-work program to retrain the former textile workers in woodworking and cabinet making. According to Risom, only 2% of his employees had high-school diplomas, so he also set up a program geared toward helping employees earn their GEDs. Jens Risom Design, Inc. The Answer Is Risom. New York, NY: Jens Risom Design, Inc., 1955.